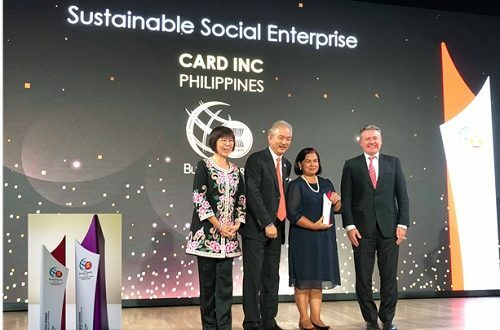 Center for Agriculture and Rural Development (CARD), Inc. (A Microfinance NGO) emerged as the ASEAN winner for Sustainable Social Enterprise category for ASEAN Business Award 2018 on November 12, 2018 held in Singapore. The award aims to recognize the outstanding social enterprises in the ASEAN region that are innovative and have made significant sustained contributions especially to the disadvantaged communities. Established in 1986, CARD, Inc. is a social development organization that aims to eradicate poverty in the Philippines and in the ASEAN Regions by providing microfinance and community-based development programs. The award was received by Flordeliza L. Sarmiento, Managing Director of CARD Mutually Reinforcing Institutions (CARD MRI), a group of 21 development-oriented institutions including CARD, Inc.
“We are deeply grateful for this recognition. This award will serve as an inspiration for us to continue with all our efforts toward social development and poverty eradication,” said Sarmiento. Based in San Pablo City, Laguna, CARD, Inc. now has more than 1,700 offices all over the Philippines reaching more than 2.1 million microfinance clients from the rural and island towns and municipalities. 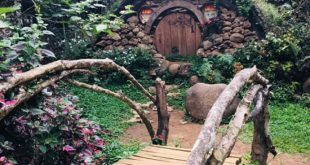 CARD, Inc. has also extended its microfinance operations in Myanmar, technical assistance in Cambodia, Vietnam, Laos, Indonesia, Thailand, and financial literacy program in Hong Kong. “We want to share this award to our CARD MRI family – our beloved clients, hardworking staff, and generous partners. Without these people, CARD would not be able to realize the institution’s vision and mission,” shared Dr. Jaime Aristotle B. Alip, founder and chairman emeritus of CARD MRI.